Yesterday, Leslie Nielson died at the age of 84. He was a very unique comedian. He’s undoubtably best remembered for his Airplane! and Naked Guns roles. He used that fame to do a bunch of other films but nothing beat Lt. Frank Drebin from Police Squad. 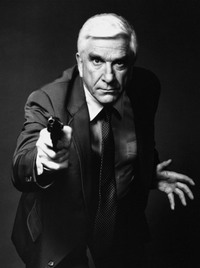 His performance in the first Naked Gun was probably my earliest memory of laughing uncontrollably in a movie theater. I was unable to contain myself. In the monologue, Leslie explained that he didn’t understand why he had been asked to host a comedy show, because he was neither a comedian nor a comic. A comedian, he explained, was someone who says funny things. A comic was someone who says things in a funny way. Nielsen, on the other hand, was someone who said unfunny things in an unfunny way, and for some reason, people laughed. To demonstrate this, he delivered an innocuous line – something along the lines of “Mr. Jones, sit down, I’d like to talk to you about your son” – twice. The first time, he said it as though he were in a drama, and the response was muted. Then he told us that he was going to say the exact same unfunny line as Lt. Frank Drebin, in an unfunny way, and he did exactly that, and the audience exploded. It wasn’t just indulging him as prompted, either. Without actually tilting his delivery in that direction, Nielsen made it genuinely funny. I couldn’t find the YouTube clip for this but it shows exactly why he’s a master at what he does and it makes you appreciate his craft. Saying unfunny things in an unfunny manner and magically having the result be funny is an incredibly hard trick. And nobody ever did it better. Mike, also, I read that when he was hired to do the first of his many comic roles, it was commented on by the studio that he was being miscast to act as a comedian. His reply that was up to then – that was the miscasting. He had always wanted to do comedy. Thank goodness he was “miscast” so that we could laugh our ways through some otherwise dull decades.